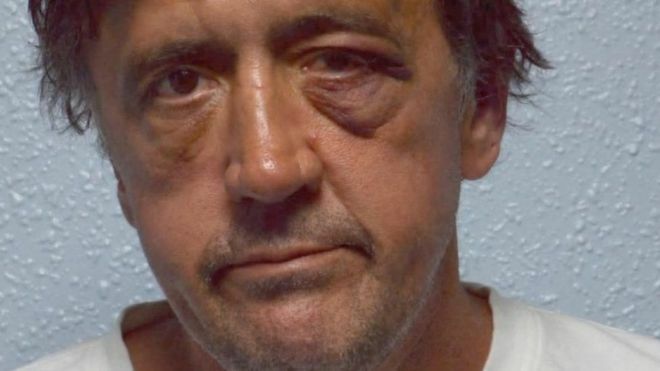 Darren Osborne has been jailed for life – with a minimum term of 43 years – for carrying out the Finsbury Park terror attack. Justice Cheema-Grubb said she had not given Osborne a rare full-life term because he did not achieve his original aim to kill multiple victims at a pro-Palestinian march. “This was a terror attack,” the judge said, adding that the Metropolitan Police’s security arrangements around the Al-Quds Day rally had “saved many lives”. Sentencing Osborne to two concurrent life sentences with a minimum term of 43 years, minus the 224 days already served in custody, she said his lengthy criminal record betrayed a “belligerent and violent character”. A jury had found the 48-year-old guilty of murder and attempted murder at the end of a nine-day trial, dismissing what the judge called a “pathetic last-ditch attempt to deceive them” by claiming a man called Dave was behind the wheel. Woolwich Crown Court had heard how Makram Ali, a 51-year-old grandfather, had collapsed just two minutes before the atrocity shortly after midnight on 19 June. A crowd of Muslim worshippers, several of them wearing traditional clothing, gathered around him to help and became an unwitting target for Osborne as he looped around Finsbury Park in search of a mosque. Woolwich Crown Court heard that Osborne has a criminal history spanning 30 years, which could not previously be disclosed because it could prejudice the jury. Prosecutor Jonathan Rees QC said he had appeared in court for 33 times for 102 offences dating back to when he was just 15 years old. Mr Rees said Osborne had eight years where he was “relatively trouble free” around the birth of his first child, but was later convicted for shoplifting and theft in South Wales. Lisa Wilding QC, Osborne’s barrister, had urged the judge not to use a whole-life term warranted by his motivations. “Although this case has been properly characterised as an act of terror, it’s arguably not the most grave of its type,” she told the court. Ms Wilding highlighted the fact that Osborne was a functioning alcoholic with a troubled past, saying the previous convictions had no racial element and he ”became radicalised in a short period of time“. Mr Ali’s relatives were in court for the sentencing hearing, where his wife, six children and two grandchildren told how they were unable to fully grieve until the end of the gruelling trial. His eldest daughter, Ruzina Akhtar, said she had been “struggling not to fall apart” since the attack. In a statement, she described how the family faced an agonising wait for Mr Ali’s death to be confirmed. She told how the family live near the scene of the attack and are traumatised from passing it on a daily basis, while her mother fears leaving the house or sleeping alone. “My mum is scared of going out by herself and being attacked because she is visibly a Muslim and wears a headscarf,” she added. Ms Akhtar paid tribute to her father as a “family man”, saying he spent his final moments before leaving the house on the night of his death with his wife and children, who are as young as 13. He was beloved by her five-year-old son, who “is always asking where his granddad is and why he can’t go to the park with him every day” like they used to. Statements from the survivors of the attack told how they suffer from physical injuries as well as nightmares, flashbacks, insomnia and other effects of trauma have had a terrible impact on their personal lives and work. A note found in the vehicle – scribbled down in a pub the night before – showed Osborne raging against Muslims, grooming gangs, Jeremy Corbyn, Sadiq Khan and Lily Allen. He denied charges of murder and attempted murder but submitted no statement in his defence until Friday – after hearing five days of evidence proving his guilt.